This fresh looking handmade quilt, featuring a classic and striking pattern, is simple to make with great results. Create your own quilt in your choice of colours, or follow the pictured pretty example of "Hello Darling" by Bonnie and Camille for a sweet and vintage inspired quilt. The quilt is made from 9 large blocks, using a total of 9 FQ's for the feature prints. Extra fabric is required for the background, sashing, borders and binding. One finished block is 20" square. 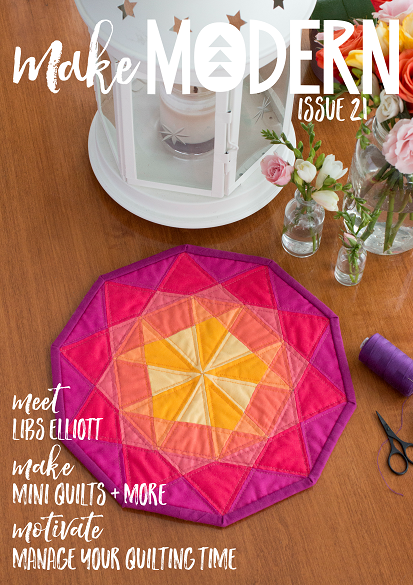 The PDF pattern is available for immediate download, and features extensive instructions for how to create your own quilt. The finished quilt is a Queen size at 81" square, but is easily adaptable to a larger or smaller quilt based on the number of blocks completed. The pattern includes clear and well thought out instructions and diagrams, and is easy to read. The pattern has been thoroughly tested by a range of different quilters.